I can’t handle orzo pasta. Like the Eskimos and the concept of snow, Italians have 300 hundreds different words for pasta. 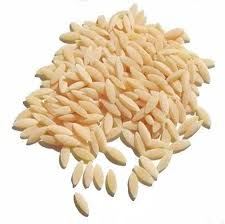 For those of you who don’t know which is orzo, it looks like a giant grain of rice. My brain strips a thread when it comes to orzo and I can’t eat the damn stuff. The problem is that my eyes see rice, but my tongue tastes pasta, and my brain merges them in a bad scientific process to create a taste that is neither. My mind totally crashes and I have to spit the stuff out. For me, it’s totally inedible. So, I don’t eat orzo. Just the idea of the stuff makes me wrinkle my nose. Julie has to act as monitor, so that I don’t accidentally order it with something. She says things like, “Remember, that’s the weird pasta, Simon, so don’t order it.” She says this like I’m weird or something and shouldn’t be allowed out unsupervised. Now that’s weird. Don’t you think? I am the same with with this weird layered dessert my mom makes- I like all the ingredients that go into the dessert…but just something about the dessert that I can’t stand. :/ Bleck. But it’s your mum!! Bad daughter!! !